What Exercises Burn Fat for a 16-Year-Old Girl? Getting in some exercise every day can help teen girls build strong bones, healthy muscles and maintain their weight. If your doctor has told you that you should lose some weight, exercise can also help you lose those extra pounds. Any extra activity will help you reach you goal, but some forms of exercise are more effective than others at burning fat. If you're not used to exercising much, begin small. You don't want to burn out before you have a chance to see results. Start by walking around your block a couple of times per day or walking to nearby friends' houses instead of relying on a car. The next week, add another five minutes to each session. When you're new to working out, exercise can result in some muscle soreness. However, you should slow down and work up at a more gradual pace if your exercise routine causes you to feel pain. Ask your parents to sign you up for at least one session with a certified trainer if you need help developing a workout plan. Teen girls should get at least 60 minutes of cardio exercise per day, recommends the U.S. Office on Women's Health. If you're so busy with after-school activities that you don't have a full free hour in your day, break up your exercise into mini-workouts that last at least 10 minutes. Jogging 15 minutes to and from school, swimming for 20 minutes when you get home, and walking your dog for 10 minutes while your dad cooks dinner all contribute to your daily exercise needs. Also include at least three strengthening exercise sessions each week and let each last 20 minutes to an hour. Warm up for at least 10 minutes before you strengthen your muscles, repeating each exercise 12 to 15 times in one or two sets. Work only two to three muscle groups per session and give each muscle group at least one day of rest. 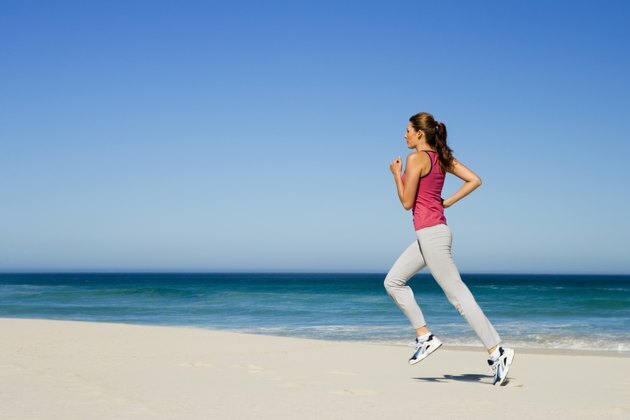 Cardio exercises are ideal for burning fat because they require you to consistently exert energy. To get in some cardio exercise, go rollerblading or running with some friends, bike to and from school, sign up for tennis lessons, take a high-impact aerobics class at the gym or play a dance video game. Fast-paced exercises such as running tend to burn more fat calories than do moderate-intensity exercises such as walking. However, you may burn out faster if you do only high-intensity exercise, so aim for a balance of the two. Your muscles get stronger when they work harder than usual against extra weight. As a 16-year-old girl, your body is still developing, so trying to build bulky muscles by lifting large weights can cause damage to your tendons, muscles and cartilage, according to the MayoClinic.com. However, doing some basic strength training exercises such as Pilates, yoga or pushups can get you a more toned body. Additionally, having more muscle tissue will help you burn fat at a faster pace. The Nemours Foundation: How Can I Lose Weight Safely? What Is the First Thing to Do to Start Losing Weight? What Happens to Your Body When You Don't Exercise?